The state legislature chartered the university in 1869 as a land-grant university under the 1862 Morrill Act, two years after Nebraska's statehood into the United States. Around the turn of the 20th century, the university began to expand significantly, hiring professors from eastern schools to teach in the newly organized professional colleges while also producing groundbreaking research in agricultural sciences. The "Nebraska method" of ecological study developed here during this time pioneered grassland ecology and laid the foundation for research in theoretical ecology for the rest of the 20th century. The university is organized into eight colleges on two campuses in Lincoln with over 100 classroom buildings and research facilities. Its athletic program, called the Cornhuskers, is a member of the Big Ten Conference. The Nebraska football team has won 46 conference championships since 1970 and five national championships. The women's volleyball team has won five national championships along with nine other appearances in the Final Four. 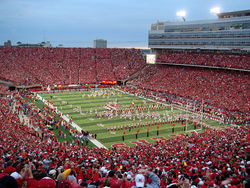 The Husker football team plays its home games at Memorial Stadium, selling out every game since 1962. The stadium's capacity is about 92,000 people, larger than the population of Nebraska's third-largest city. The University of Nebraska was created by an act of the Nebraska state legislature in 1869, two years after the State of Nebraska was admitted into the U.S. The law passed in 1869 creating the university described its aims: "The object of such institution shall be to afford to the inhabitants of the state the means of acquiring a thorough knowledge of the various branches of literature, science, and the arts." The school received an initial land grant of about 130,000 acres (53,000 ha) and the campus construction began with the building of University Hall in its first year. By 1873, the University of Nebraska had offered its first two degrees to its first graduating class. The school remained small and suffered from a lack of funds until about 20 years after its founding, when its high school programs were taken over by a new state education system. From 1890 to 1895 enrollment rose from 384 to about 1,500. A law school and a graduate school were also created at about this time period, making it the first school west of the Mississippi to establish a graduate school. By 1897, the school was 15th in the nation in total enrollment. Through the turn of the 20th century, the school struggled to find an identity as both a pragmatic, frontier establishment and an academic, intellectual institution. It also developed a competitive spirit in the form of a debate team, a football team (first called the Cornhuskers in 1901), and the arrival of fraternities and sororities. In 1913–14, a fierce debate ensued over whether to keep the University in downtown Lincoln or to move it out of town. The issue was not resolved until a statewide referendum sided with the downtown plan. After purchasing property downtown, the school experienced a building boom, both on the new property and on the farming campus. The school would not experience another boom until the late 1940s, when the sudden arrival of thousands of soldiers returning from the war for an education forced the school to seek further expansion. In 1908, Nebraska was inducted as a member of the Association of American Universities, an organization of research universities. In recent years, Nebraska had been at or near the bottom of the AAU's statistical criteria for members, a ranking attributed in part to the university's extensive agricultural research funded by the U.S. Department of Agriculture, which is not included in the AAU's rankings because it is not awarded by peer-reviewed grants; and because Nebraska's medical school is a separate institution whose research funding is not under UNL's auspices. In June 2018, the American Association of University Professors (AAUP) voted to censure the university for violations of academic freedom. In 2017, an adjunct instructor was filmed by a student as the instructor expressed a political opinion about the student's activist activities. State lawmakers demanded that the university hold the instructor accountable and the university subsequently fired her, a move the AAUP contends was a violation of her academic freedom. University of Nebraska is governed by the Board of Regents. The board consists of eight voting members elected by district for six-year terms, and four non-voting student Regents, one from each campus, who serve during their tenure as student body president. The board supervises the general operations of the university, and the control and direction of all expenditures. The university today has nine colleges which offers more than 150 undergraduate majors, 20 pre-professional programs, 100 graduate programs and 275 programs of study. 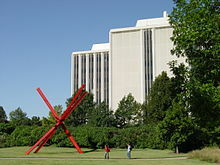 UNL also offers programs at its campus from other University of Nebraska institutions, including the University of Nebraska at Omaha College of Public Affairs and Community Service, the University of Nebraska Medical Center colleges of Dentistry and Nursing, and the Peter Kiewit Institute managed in partnership with the University of Nebraska at Omaha. In 1869, the original University of Nebraska campus was laid out on four city blocks and comprised one building called University Hall. Currently, the university has three campuses, totaling 2,815 acres (1,139 ha): City Campus, to the north of downtown Lincoln, Nebraska Innovation Campus, northeast of City Campus on the old Nebraska State Fair grounds, and East Campus, one mile east of Innovation Campus. Both City and East campuses include academic and research facilities, libraries, recreation centers and residential buildings. They also include various support buildings for power, networking, as well as in-ground infrastructure supporting advanced computing, power distribution and energy-efficient heating and cooling from central plants. Both campuses are invitingly-landscaped, and the grounds function as well as a research mission of the university; they are administered as the UNL Botanical Garden and Arboretum; major plantings include Cather Garden on City Campus and Maxwell Arboretum on East Campus. Nebraska Innovation Campus, situated between City and East campuses, is a public/private research park. Constructed on the former Nebraska State Fairgrounds, its buildings include several thoroughly-modernized former fair buildings with significant architectural features. In January 2010, the university acquired a 249-acre (101 ha) property north of city campus that had been used to host the Nebraska State Fair. Plans for redevelopment include an US$800 million expansion called the Nebraska Innovation Campus to house agricultural biotechnology and other life science research. The grand opening of Adele Coryell Hall Learning Commons was on January 11, 2016. Named in honor of alumna Adele Coryell Hall (Class of 1953), this $10 million, 30,000 square foot project was made possible from nearly $7 million in private donations. This addition is located on the first floor of Love Library North and is open 24 hours per day, 7 days per week. It features 18 private study rooms that are all equipped with wall-to-wall whiteboards and smart TVs. UNL has student union facilities on both City and East campuses. The Nebraska Union is the located on the southern part of City Campus, northeast of 14th and R Streets. The Nebraska East Union is located to the east of East Campus Mall. 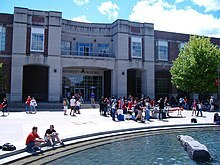 The Unions offer many services to students, including dining, banking, computer labs, and recreational activities. University Bookstore locations are available at each facility. The Nebraska Union also provides meeting space for student organizations, events, and speakers. The Nebraska Union also includes offices for The Daily Nebraskan, student government, Greek Affairs and the Women's Center. The East Union offers the Loft Gallery, providing space for community and student artwork. The East Union also offers a full-service bowling alley, which is the home facility for the five-time national champion Nebraska Bowling team. 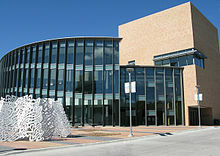 The Lied Center for Performing Arts is a performing arts venue used primarily for orchestra concerts and theatre performances. The Mary Riepma Ross Media Arts Center is a two screen theater on the UNL City Campus. It features primarily arthouse and independent films, and documentaries. The Howell Theatre, Studio Theatre, and Lab Theatre are home to the performances of the Johnny Carson School of Theatre and Film. Architecture Hall, formerly the university's library and now home of its architecture program, is the oldest building on campus. This historic structure is linked to the old law building via a glass connecting space, known as "The Link." The Kruger Collection of miniature furniture and decorative arts is on display. Since 1928, UNL has been the headquarters of the National Society of Pershing Rifles, a military fraternal organization for college-level students. John J. Pershing, an 1893 NU law school graduate and professor of Military Science and Tactics, created "Company A," a competitive drill team, for the University of Nebraska's Cadet Corps in 1891. The drill team won the National Competitive Drills in 1892, changed its name to the "Varsity Rifles" when it became a recognized fraternal organization in 1894, and changed its name again to the "Pershing Rifles" in 1895 in honor of Pershing. The International Quilt Study Center is on East Campus and will be LEED certified. The Maxwell Arboretum on East Campus is part of the Nebraska Statewide Arboretum. There are several research centers on Physics like the Brace Laboratory, Center of Materials and Nanoscience, High equipped laboratories are provided in Hamilton Hall which is the department as well and Chemistry institute. Othmer Hall houses the College of Engineering Dean's Office, the Department of Chemical and Biomolecular Engineering, and the Biological Process Development Facility (BPDF). Research in Othmer Hall's Mesoscale Engineering Laboratory has received attention in Science. Some highly equipped laboratories such as the Genetic research and Biotechnology laboratory are on East Campus. University is renowned also in Robotics. It has a well-equipped robotics laboratory. East Campus also has a wireless telecommunication system on remote sensing of Satellites. Admission to the University of Nebraska–Lincoln is rated "more selective" by U.S. News & World Report. For Fall 2015, UNL received 9,724 freshmen applications; 7,425 were admitted (76.4%) and 4,628 enrolled. The high school grade point average (GPA) of enrolled freshmen was 3.65, while the middle 50% range of SAT scores were 500-630 for critical reading and 500-660 for math. The middle 50% range of the ACT Composite score was 22-28. In terms of class rank, 26% of enrolled freshmen were in the top tenth of their high school class and 52% in the top quarter. As of 2018[update], 74% of UNL's undergraduates were classified as "white, non-Hispanic"; 53% of the undergraduate population was male and 47% female. C.Y. Thompson Library, serving the College of Agricultural Sciences and Natural Resources, the College of Dentistry and Special Education & Communication Disorders. The Marvin and Virginia Schmid Law Library serves the UNL College of Law. The University of Nebraska State Museum is on campus in Morrill Hall. The museum holds several collections and exhibits particularly featuring natural history and famously houses Mammoth bone fossils. Because of these fossils, and a large bronze Columbian Mammoth statue located in front of the building, it is popularly known as "Elephant Hall." The Sheldon Memorial Art Gallery and Sculpture Garden is home to more than 12,000 works of art in all media and is a comprehensive collection of American art with prominent holdings in 19th century landscape and still life, American Impressionism, early Modernism, geometric abstraction, Abstract Expressionism, pop, minimalism, and contemporary art. The museum has the largest collection of 20th Century North American art in the world; it includes works by such well known artists as Edward Hopper, Andy Warhol, Jackson Pollock, Mary Cassatt, Wayne Thiebaud and Georgia O'Keeffe. The Great Plains Art Museum is home to the Christlieb Collection, and features American western art and Americana. The Lester F. Larsen Tractor Museum is on the university's East Campus. It houses 40 historical tractors, an antique auto and various types of farm tools. In addition it documents Nebraska's tractor testing law examinations that to this day requires testing of all tractors to be sold in Nebraska, ensuring performance is as advertised. The Robert Hillestad Textiles Gallery is located on the second floor of the Home Economics building on the university's East Campus. It features exhibitions of textiles and clothing, both historic and contemporary. The Kruger Collection is a display of miniature furniture and decorative arts that is located within the College of Architecture. Other university art galleries include the Eisentrager-Howard Gallery and the student-run MEDICI Gallery in Richards Hall. The Lentz Center for Asian Culture is no longer open to the public. Its collection of Asian ceramics, paintings, prints, sculpture, textiles has been digitized for online viewing. The Center for Digital Research in the Humanities (CDRH) carries out numerous digital humanities projects funded by institutes like the National Endowment for the Humanities. The CDRH works with multiple departments across campus including Modern Languages, Anthropology, Art & Art History, and History. Several digital history projects, including Civil War Washington Railroads and the Making of Modern America, and O Say Can You See Early Washington D.C Law & Family. The University's English Department has an active program in the digital humanities, with digital projects such as the Walt Whitman Archive, the Willa Cather Archive, and the international collaboration Livingstone Online. Projects are also underway for the production of a free online Native American Omaha-Ponca language dictionary. In addition, the Center for Digital Research in the Humanities hosted the annual conference of the Alliance of Digital Humanities Organizations in 2014. The University of Nebraska is a participant in the Big Ten Academic Alliance. The Big Ten Academic Alliance (BTAA) is the academic consortium of the universities in the Big Ten Conference. Engaging in $10 billion in research in 2014-2015, BTAA universities provide powerful insight into important issues in medicine, technology, agriculture, and communities. Students at participating schools are also allowed "in-house" borrowing privileges at other schools' libraries. The BTAA uses collective purchasing and licensing, and has saved member institutions $19 million to date. Course sharing, professional development programs, study abroad and international collaborations, and other initiatives are also part of the BTAA. The University of Nebraska has adopted LEED certification for all new construction projects. UNL's Sustainable Food Project, started in 2005, is designed to serve meals on campus that feature locally and sustainably produced foods. The university's motor pool includes vehicles fueled by soy biodiesel as well as gasohol (85% ethanol, 15% gasoline blend). The University of Nebraska received a grade of C on the College Sustainability Report Card 2011. The University of Nebraska established a separate Office of Sustainability in 2014 with projects such as EarthStock and Bugeater Student Organic Farm. Nebraska's sports teams are nicknamed as the Cornhuskers (or simply the Huskers). They participate in Division I (Division I FBS for football) in the NCAA as members of the Big Ten Conference. The Huskers have 21 varsity teams that compete in 14 different sports and claim all or part of 23 National Championships across five sports, including volleyball, football, and gymnastics. In football, the Huskers have had three Heisman Trophy winners: Johnny Rodgers, Mike Rozier, and Eric Crouch, along with five national championship victories in 1970, 1971, 1994, 1995, and 1997.
Notable among a number of songs commonly played and sung at various events such as commencement and convocation, and athletic games are Dear Old Nebraska U (There is No Place Like Nebraska) and the University of Nebraska–Lincoln fight song, Hail Varsity. In Nebraska, the lyrics and music to Dear Old Nebraska U are attributed to Harry Pecha, a 1924 Nebraska graduate. However, other schools and locales across the United States – including the University of Chicago, the University of Florida, and the Toledo, Ohio public school system – sing similar tunes, often with similar lyrics. About 78 percent of UNL students are from Nebraska, while the rest are from all forty-nine other states and 114 foreign countries. On-campus students are also members of the UNL Residence Hall Association, which serves as the governing body for the residence halls. Select honorary seniors include the Nebraska-only Society of Innocents and the Black Masque chapter of Mortar Board. The Esther L. Kauffman Academic Residential Center. 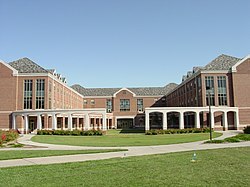 Approximately 40% of the student body lives on-campus in 15 traditional residence halls, two on-campus apartment-style halls, and three on-campus suite-style halls. Three traditional residence halls are on the East Campus: Burr, Fedde, and Love Memorial Co-op. Two on-campus apartment-style halls are located on the City Campus: The Courtyards, and The Village. Three on-campus suite-style halls are located on the City Campus: Eastside Suites, Robert E. Knoll Residential Center, and University Suites. The governing body for UNL students is the Association of Students of the University of Nebraska (ASUN). Every year students vote for a president, two vice presidents, and a senate that is composed of representatives from each college. The president also acts as the student regent to the NU Board of Regents. UNL has around 400 student organizations on campus that represent a variety of interests. Organizations are supported by Student Involvement. UNL has a significant Greek population, with about 5,200 students being members of 30 fraternities (28 chapters and two colonies) and 16 sororities. There are numerous events on campus throughout the year such as decorating "Greek Row" for the homecoming parade and various philanthropy events. The Daily Nebraskan, known to students as the "DN", is UNL's student newspaper. It was established in 1901 and was published every weekday during the fall and spring semesters and weekly during the summer until fall 2017, when the paper will publish in print once a month. UNL operates a Class A FM radio station, KRNU, which broadcasts on 90.3 FM and has a range of approximately 20 miles (32 km). The station plays mostly alternative and modern rock as well as running sportscasts of Nebraska's home events, news, live public affairs broadcasts of campus speakers and forums. In February 2008, The Publications Board recognized The DailyER as an affiliated publication and approved the printing costs of the first three issues of the satirical paper. As of 2012[update], 3 alumni have won the Nobel Prize, 8 have won the Pulitzer Prize, 22 have been selected as Rhodes Scholars, 1 has been selected as a Marshall Scholar, 29 have been selected as Goldwater Scholars and 15 have been selected as Truman Scholars. In 2010 UNL was named a Truman Scholarship Honor Institution. In the area of creative writing, the department has as a member of its faculty former United States Poet Laureate, Ted Kooser. Willa Cather, a Pulitzer Prize recipient, is a notable literary alumna. The school's University of Nebraska Press is the second-largest public university press in the United States. ^ "University of Nebraska Administration - History & Mission". Nebraska.edu. Retrieved 2015-12-23. ^ "Common Data Set 2018-2019, Part I" (PDF). University of Nebraska–Lincoln. ^ a b c d "Common Data Set 2018-2019, Part B" (PDF). University of Nebraska–Lincoln. ^ Toolbox & Brand Book (PDF). University of Nebraska–Lincoln Communications & Strategic Marketing. Retrieved August 12, 2016. ^ "Carnegie Classifications – University of Nebraska". Carnegie Foundation for the Advancement of Teaching. Retrieved September 6, 2010. ^ Vandervoort, Frances (1999). "A Green Centennial". The American Biology Teacher. University of California. 61 (9): 648–659. doi:10.2307/4450796. JSTOR 4450796. ^ Merchant, Carolyn (2005). "Chapter 9: The Rise of Ecology 1890–1990". The Columbia Guide to American Environmental History. Manhattan, NY: Columbia University Press. pp. 163–164. ISBN 978-0-231-11233-8. Retrieved September 9, 2010. ^ "UNL Historic Buildings – Historical Overview". Lincoln, NE: University of Nebraska–Lincoln. 2005. Retrieved September 5, 2010. ^ "Nebraska volleyball history". NU Athletics. Retrieved September 5, 2010. ^ "Husker Football History" (PDF). Huskers.com. Retrieved September 5, 2010. ^ "Memorial Stadium – Home of the Huskers". Huskers.com. 2010. Retrieved September 5, 2010. ^ Pound, Louise. Semi-centennial Anniversary Book. Lincoln: University of Nebraska Press. 1919. p. 14. ^ Pound, Louise. Semi-centennial Anniversary Book. Lincoln: University of Nebraska Press. 1919. pp. 11–19. ^ "UNL Historic Buildings - Historical Overview". Historicbuildings.unl.edu. Retrieved 2012-05-20. ^ Knoll, Robert E. (August 1, 1995). "The Pattern of the Modern University". Prairie University: a History of the University of Nebraska. Lincoln: University of Nebraska Press. pp. 47–54. ISBN 978-0-8032-2717-0. Retrieved September 6, 2010. Excerpt available at Google Books. ^ Hine, Chris (June 13, 2010). "Nebraska has it all to attract Big Ten, most importantly AAU membership". Chicago Tribune. ^ Abourezk, Kevin (April 29, 2011). "Research universities group ends UNL's membership". Lincoln Journal Star. Retrieved May 4, 2011. ^ Reed, Leslie (April 30, 2011). "Academic group drops UNL". Omaha World-Herald. Archived from the original on January 27, 2012. Retrieved May 4, 2011. ^ Lewin, Tamar (May 2, 2011). "American Universities Group Votes to Expel Nebraska". The New York Times. Retrieved May 4, 2011. ^ Selingo, Jeffrey J.; Jack Stripling (May 2, 2011). "Nebraska's Ouster Opens a Painful Debate Within the AAU". The Chronicle of Higher Education. Retrieved May 4, 2011. ^ Flaherty, Colleen (June 18, 2018). "AAUP Censure for Nebraska". Inside Higher Ed. Retrieved June 18, 2018. ^ a b "UNL | Colleges and Departments A-C". Unl.edu. 2009-07-23. Retrieved 2012-05-20. ^ "Botanical Garden and Arboretum". University of Nebraska. Retrieved June 26, 2017. ^ "University of Nebraska Innovation Campus". University of Nebraska-Lincoln. Retrieved June 26, 2017. ^ "University of Nebraska Board of Regents approve Innovation Campus". JournalStar.com. Retrieved August 2, 2011. ^ "Nebraska Innovation Campus". University of Nebraska–Lincoln. Retrieved August 2, 2011. ^ "UNL celebrates opening of Adele Hall Learning Commons". ^ Fedderson, Troy (January 5, 2016). "Learning Commons to include Dunkin' Donuts location". University of Nebraska- Lincoln. ^ Bowling, Chris (January 12, 2016). "UNL unveils $10 million renovation to library learning commons, 'a different kind of space'". Omaha World Herald. ^ "Kruger Collection". University of Nebraska-Lincoln. Retrieved 20 September 2017. ^ "U.S. News Best Colleges Rankings: University of Nebraska–Lincoln". U.S. News & World Report. 2016. Retrieved March 2, 2016. ^ "Common Data Set 2015-2016, Part C" (PDF). University of Nebraska–Lincoln. ^ "About UNL Libraries". University of Nebraska-Lincoln Libraries. Archived from the original on September 19, 2008. Retrieved September 22, 2008. ^ "Great Plains Art Museum". Center for Great Plains Studies official website. The Great Plains Art Museum opened in 1981 after a generous donation from Dr. John and Elizabeth Christlieb of Bellevue, Nebraska. The Christlieb Collection… consists of approximately 170 bronze sculptures, 140 paintings and drawings, 100 other works on paper and several hundred photographs, and includes artwork by Albert Bierstadt, William de la Montagne Cary, Robert Fletcher Gilder, William Henry Jackson, Frederic Remington, Charles M. Russell and Olaf Wieghorst. The library donated by the Christliebs is an impressive 4,000 volumes, which consists of several Western novels and many other fiction and nonfiction books about the West and the Great Plains. ^ "Robert Hillestad Textiles Gallery". UNL. Retrieved 20 September 2017. ^ "Kruger Collection". UNL. Retrieved 20 September 2017. ^ "Eisentrager-Howard Gallery". UNL. Retrieved 20 September 2017. ^ "BTN LiveBIG: Nebraska, Maryland historians uncover fascinating details of American slavery ". Big Ten Network. ^ "Railroads and the Making of Modern America". railroads.unl.edu. Retrieved 2016-11-15. ^ "O Say Can You See: Early Washington, D.C., Law & Family". earlywashingtondc.org. Retrieved 2016-11-15. ^ "The Walt Whitman Archive". www.whitmanarchive.org. Retrieved 2016-11-15. ^ "Willa Cather Archive". cather.unl.edu. Retrieved 2016-11-15. ^ "Sharing Access to Courses". Big Ten Academic Alliance. Retrieved 30 June 2016. ^ "Leadership Development". Big Ten Academic Alliance. Retrieved 30 June 2016. ^ "Global Collaborations". Big Ten Academic Alliance. Retrieved 30 June 2016. ^ "University of Nebraska–Lincoln Report Card 2011". Sustainable Endowments Institute. 2010. Retrieved November 2, 2010. ^ Remembering Nebraska's historic three championships in four years - NCAA Football - SI.com. Sportsillustrated.cnn.com. Retrieved on 2014-04-12. ^ "UNL Band fight songs". University of Nebraska–Lincoln. Retrieved December 2, 2007. ^ "F-L-O-R-I-D-A, or is it T-O-L-E-D-O? – The Gainesville Sun". Gainesville.com. 2005-10-09. Retrieved 2012-05-20. ^ "UNL | Student Involvement | Student Organizations | Resources and Tools". Retrieved December 10, 2010. ^ "Prepare for Your Future". University of Nebraska–Lincoln. Retrieved October 14, 2012. ^ "UNL named honor institution for supporting Truman Scholar". University of Nebraska–Lincoln. July 7, 2010. Retrieved October 14, 2012. ^ "Ted Kooser Biography". American Life in Poetry. Retrieved 2012-05-20. Wikimedia Commons has media related to University of Nebraska–Lincoln. "Nebraska, University of" . Collier's New Encyclopedia. 1921. "Nebraska, University of" . New International Encyclopedia. 1905.